"Parents beware, the two relentlessly infantile voices of a lost generation have made the jump in screen resolution from MTV to your computer. What's funny is that they don't look any better. In fact, the crudely-drawn stylized artwork of the television series is accurately reproduced on the jagged lines of a computer screen. To complete the effect, Viacom New Media borrowed the original voice talent from the series, which creates a very smooth transition from linear to interactive, and in the process one very funny game. All you'd expect from the eternally juvenile duo is here: fart jokes, painfully obvious sexual innuendoes, glorification of anything illegal or immoral, and the fruitless pursuit of girlfriends with one-liners such as, "Hey, um, do you like to do, like, stuff?" As with the show, the writers' satirical genius puts these antics into a perspective that makes everything undeniably funny. You appropriately control the two half-wits with a simple set of commands, using a mouse-driven interface that looks and operates suspiciously like a LucasArts adventure game. 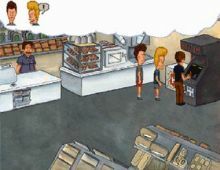 In fact, Virtual Stupidity is largely unoriginal in its approach to interactive adventures, and even some of the puzzles are secondhand fare. But that's just not the point here. What makes this game so entertaining (and I gleefully played it through to the end) are the actions and reactions of the intelligence-challenged duo to the people and objects around them. Imagine the two as they interrogate patients on a mentally-deranged ward at the local jail. Or picture the look on Beavis' face as he inflates his shorts with a gas station air hose. Priceless. Some adventure games test your cunning, your skill, and your MacGyver-like aptitude in building a flare gun from toothpicks and oily cloth. Virtual Stupidity does none of the above, but instead thrives as a refreshing, contemporary, relaxing exercise in moronic humor." There you have it-- one of the best adaptations of a famous TV license I've ever come across. Too bad all subsequent Beavis & Butthead games were inferior to this first release, and even got worse as time goes by. The voice acting (done by all original cast members of the show) is simply superb. Two thumbs up, way up!